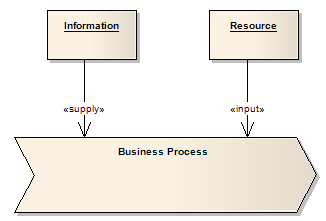 Business processes use information to tailor or complete their activities. Information, unlike resources, is not consumed in the process; rather it is used as part of the transformation process. Information can come from external sources, from customers, from internal organizational units and could even be the product of other processes. A resource is an input to a business process and, unlike information, is typically consumed during the processing. For example, as each daily train service is run and actuals recorded, the service resource is 'used up' as far as the process of recording actual train times is concerned. The notation to illustrate information and resources is shown here. A Supply connector indicates that the information or object linked to the process is not used up in the processing phase. For example, order templates can be used over and over to provide new orders of a certain style; the templates are not altered or exhausted as part of this activity. An Input connector indicates that the attached object or resource is consumed in the processing procedure. As an example, as customer orders are processed they are completed and signed off, and typically are used only once per unique resource (order).